We offer Quality Management System certification consultancy and documentation for manufacturers. We are providing training, implementation, documentation as well as complete certification consultancy since 1995. We are recognized in global market as quality system consultants and so far many companies globally have taken our services for implementation of quality management system as per ISO 9001:2008 guidelines in their organizations. The revision of ISO 9001 standard, named as ISO 9001:2015, was released in September 2015. In line with this standard, our team has designed readymade documentation kit to help manufacturing units. Our team of experienced quality system consultants has designed this ISO 9001:2015 Documentation Kit, which will help companies to establish effective quality management system documentation as per requirements of ISO 9001:2015, and hence, quick certification. Our QMS Consultants develop a management system that facilitates compliance with the requirements of customers and pre-eminently-various global regulators. If any organization establishes a good documentation system for implementation of ISO 9001 with the help of effective quantifiable objectives, it helps them to make vibrant work culture for the organization. The Documentation Kit for ISO 9001:2015 Certification for Manufacturing units / companies is designed by our team to help such organizations establish effective quality system and get quick certification. The editable documented information are provided to address ISO 9001:2015 standard requirements, including ISO 9001 manual, procedures, SOPs, exhibits, blank forms, process flow charts as well as audit checklist - both department-wise and requirement wise. It is a complete ISO 9001:2015 revised document toolkit, which is designed to help manufacturing units move forward at a much faster pace. Any organization can easily modify our documents as per their company’s requirements and within 4 to 5 days their entire documents with all necessary controls will be ready. Sample Risk Templates to implement risk process approach as per 2015 requirements. Total Quality Management System Documentation Kit for manufacturing organization is well-written in simple English and available in editable word format. The documentation kit can be used as a very good tool that covers all the new 2015 system requirements. While preparing documents for your organization, you just need to minimal editing in this documentation set and you will complete the QMS documentation process in just a couple of days. Looking for ISO 9001 certification for your organization ? Contact Certification Consultancy for ISO 9001 documents, ISO 9001 manual and avail ISO 9001 consultancy. The Documentation Kit for ISO 9001:2015 Certification for Manufacturing units / companies has been designed by our team of highly qualified and experienced consultants. Time saving documents - you can save a lot of your precious time while preparing the Quality System documents. Takes care for all the sections and sub-sections of the requirements that help you in establishing better Quality. Documentation kit enables you to change the contents and print as many copies as you need. The users can modify the documents as per their industry’s requirements. Readymade templates for ISO 9001:2015 manual, procedures, process approach, checklists are included, which can reduce your time and cost of document preparation for quick certification. The audit questions help in making perfect internal audit checklist to monitor implementation of quality system. You will get better control on your system, as our proven formats and templates are developed under the guidance of our experts having rich experience of more than 20 years in certification consultancy. 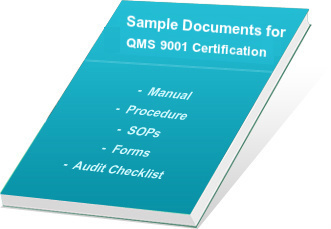 Many companies are implementing or upgrading their QMS system to ISO 9001:2015 and getting benefits of certification as improved quality in day-to- day business. Our product is highly sold globally and ensures total customer satisfaction. During preparation of documentation kit; it is verified and evaluated at various levels of our team and more than 1000 hours are spent in its preparation. Following are the links of partial documentation kits and DEMO, for users looking to purchase any of our low-priced QMS document set, separately. On successful completion of payment process, we provide username and password to download the product from our FTP server. Delivery of our products will be within 12 to 24 hours of payment confirmation by secure third-party payment gateway. View free Demo of Documentation Kit and purchase it with secure online transaction. We ship worldwide and our products are used in more than 90 countries.